Left in July, returning in June. For nearly a year I’ll have lived in a third-world country. Uganda has been everything I hoped it would be, and yet it’s been nothing like I imagined. I am forever changed, and I am returning to the United States a totally different person. I have ten days until I return to the United States. I’m sure there will be plenty of memorable moments in the coming days, including a safari with the 12th graders, and I had some amazing moments in my two trips to Kenya, but right now I want to reflect on 10 of the most memorable moments from the past year in the Pearl of Africa. 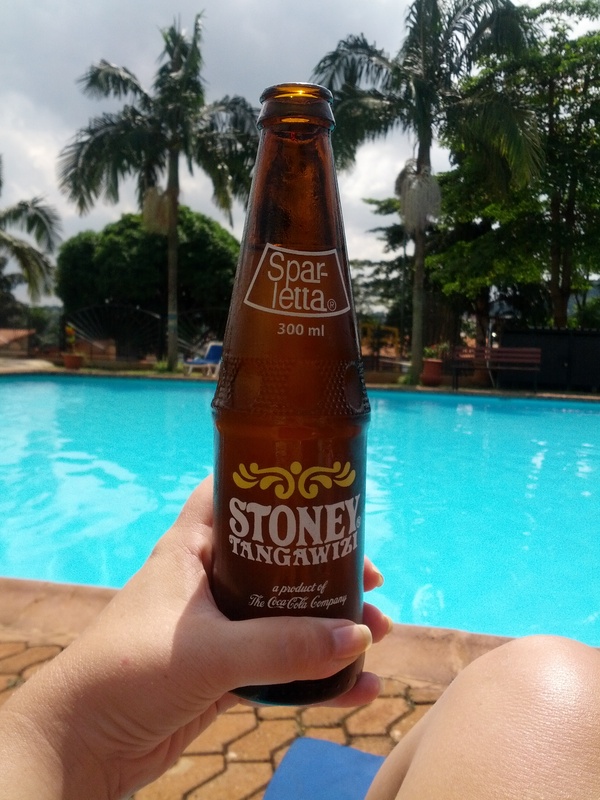 These are the silly moments, the moments that are behind the scenes in the lives of expats living in Uganda. My roommate Ashlie and I were psyched. We are going to eat raw for one week. We would lose a good amount of weight and use it as a jumping off point for eating healthier overall. Our great adventure was kicked off with a trip to Ggaba Market. 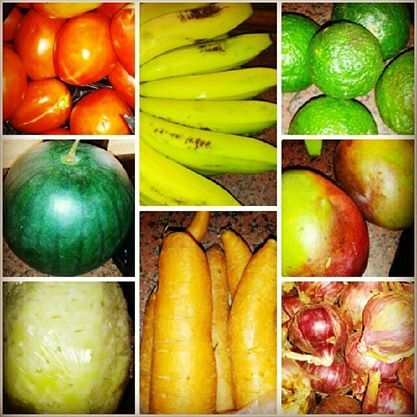 Our arms literally ached from the many bags of fruits and vegetables we collected and carried back to our apartment. The night before the big day (our first day eating raw), we chopped and sliced like crazy. We even found lots of great raw recipes online. Eating raw was going to be amazing! Monday came. I had a delicious smoothie for breakfast. For lunch I munched on carrots. Come 3 p.m., I was starving. I remember walking into our apartment. Ashlie sat on the couch with Analeigh and said, “Do you want to eat at Little Donkey tonight?” My stomach rumbled as I thought of my favorite shredded beef burrito and guacamole. “Yes!” I replied with enthusiasm. We were officially failures. Eating raw lasted approximately 12 hours, and many of our co-workers loved making fun of us when we failed. But Ashlie and I will never forget the 12 hours we went raw! Every Stoney I’ve had is memorable. Stoney is a heavenly drink that Coca-Cola has for some reason decided should not be available in the United States. It’s a refreshing blend of ginger and soda, so strong that sometimes one sip will make you cough. I have had Stoney’s at dinner, at school, at the beach, by the pool, and just lounging on the front porch. Every moment with a Stoney is memorable. It was December, and a group of ladies had gone Christmas shopping downtown. My car was loaded with me, Ashlie, Abbey, and Tiffany. About halfway home, the road we typically take was closed. This forced us to take a detour. This wasn’t just any detour. This was a detour that movies are made of, like when the Americans get lost in a third-world country and never again see the light of day. The detour through a super sketchy neighborhood gave us all sorts of interesting sights: cats who looked like they were on meth, boda drivers who smelled like meat and cheese, nuns, and beggars who didn’t even want our G-nuts for a snack. It had been a long day, and we were downright delirious. I’m not sure I’ve ever laughed and cried as much as we did on our detour. You definitely had to be there, but it was a moment I will never, ever forget from my time in Kampala. I screamed my head off. A giant African cockroach was crawling around our kitchen counter. “Ashlie! Bring the Doom!” I yelled. She knew what that meant. 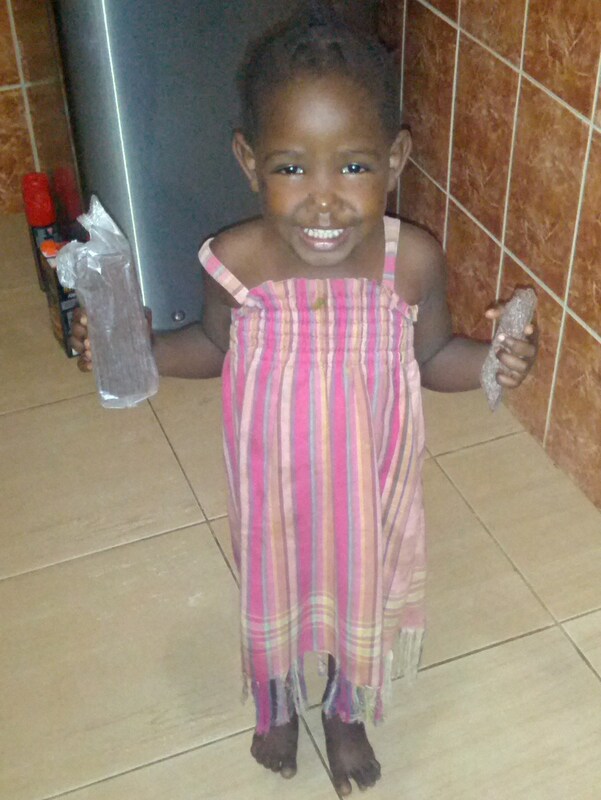 She grabbed the can of Doom, Uganda’s version of Raid, and ran in the kitchen. Ashlie chased the giant bug as it crawled around the counter. She doused it in Doom, but it was resilient. It wasn’t going to die. Somehow, the roach made its way into a big pot on the counter. We were afraid to look and see if he was alive or not. As we slowly approached the pot to peer inside, the roach catapulted itself out of the pot and back onto the counter. Our screams echoed throughout all of Kampala, but after a few more minutes of spraying, the roach was finally dead. It was Sunday morning, and we were headed to church. As I rounded the corner of our second-story apartment porch, I looked down the stairs and saw a kitten. I started to say, “Awww!” when my eyes were drawn to something further down the stairs. “O….M…G….” I screamed, loud enough that the neighbors heard. Ashlie walked around the corner and saw the kitten. “It’s just a kitten!” she said. There on the steps was a dead baby chicken. 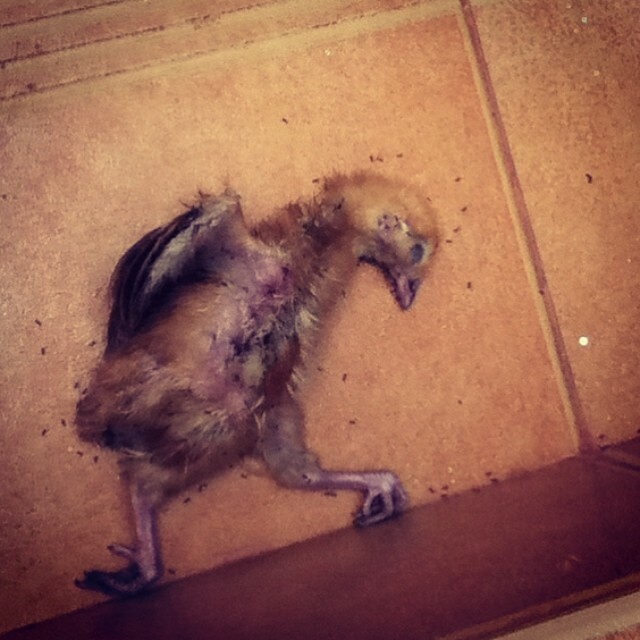 How a chicken even got on our compound is a mystery, but he clearly didn’t last long! It started off almost as a pimple, but after a few days, it had grown. And it looked nasty. 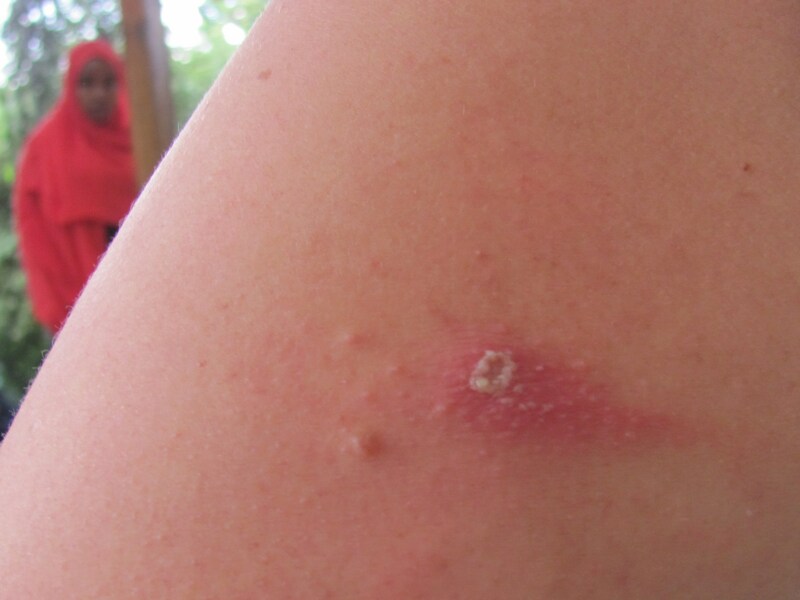 The disgusting sore on my arm changed shape and size every day, and it was growing new blisters by the minute. Finally, I went to the doctor to have it checked out. As usual, the doctors didn’t have much of an answer, except that it might be a caterpillar burn. A what? Yup. Many of the caterpillars here in Uganda are poisonous. Just brushing up against the wrong kind of caterpillar can literally burn your skin. To fix me, they popped all the blisters, drained out some nasty stuff, and then packed it with honey and gauze. Yes, honey, the apparent fix-all for any skin problem in Uganda. Sure enough, after a few days they took off the gauze, cleaned off the honey, and I was good to go! I do, however, have a scar from my caterpillar burn. I’m quite proud of it. How many people can say they have a scar from an encounter with an evil caterpillar? Living on the equator means getting burnt after only a few minutes in the sun. It’s a pain, but living on the equator also means experiencing awesome, once-in-a-lifetime things like a solar eclipse. 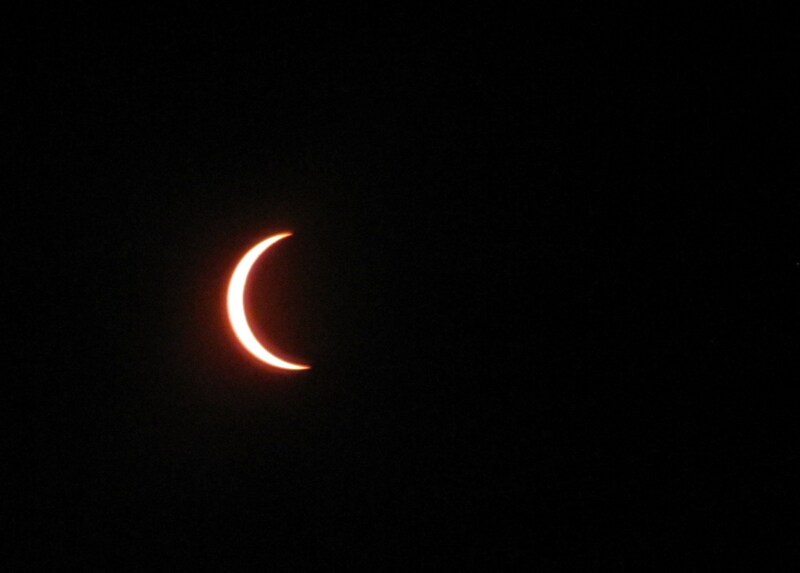 In November we observed a solar eclipse here in Kampala. It happened in the evening, and while it did get darker than usual, it was not a full eclipse that darkened everything. Still, I’ll never forget viewing it through the solar shades the school provided everyone. It was an event I’ll always remember. I thought there was a McDonald’s in every country. Or maybe even a Taco Bell. 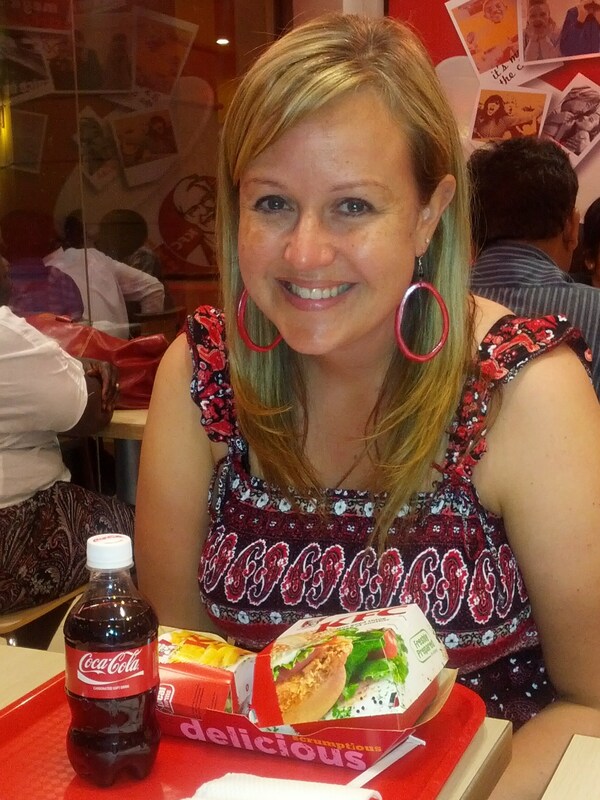 There had to be SOME sort of Western fast food restaurant in Uganda that would cure our cravings when we missed home. Until December. Kentucky Fried Chicken opened its doors to the people of Uganda, and we were some of the first in line to experience the awesomeness. Did I eat a lot of KFC when I lived in America? Not at all. Hardly ever, actually. But just to have a taste of home was something we were dying for by our fifth month here. It was one of the best meals I’ve had in Uganda, simply because it was a small reminder of home. It happens here. A lot. The power goes out and you never know if it will come back on within a few minutes or a few days. We quickly learned, however, that you just have to make the best of it. There was one night we were particularly excited because we had purchased bread, pizza sauce and mozzarella cheese at the store. (Cheese can be next-to-impossible to find around here.) We were going to make one of our favorite dinners- pizza bites. But the power went out. 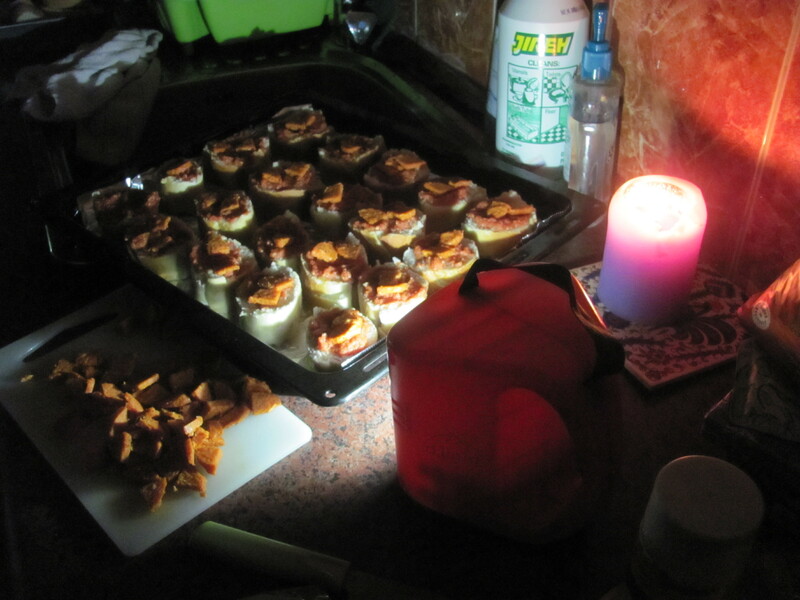 Being the awesome gals we are, we didn’t let the lack of electricity cramp our style. Me, Ashlie, Stephanie, Elise and Nyenhial and her two boys packed ourselves into the kitchen, made our dinner by candlelight, and sang the hits of the 90’s. It was most definitely one of my favorite Africa memories! Florence, our dayguard’s daughter, is quite possibly one of the cutest four year olds on the planet. It’s such a blessing to be greeted by her each day, and sometimes we like to hang out. Florence knows very little English, but that doesn’t stop us from having fun. Sometimes we just play on the porch, sometimes I paint her fingernails and toenails, and the other day we watched Frozen. Her reaction to everything was priceless. Throughout most of the movie she just pointed at my laptop screen and smiled. And the icing on the cake was after the movie when she looked at me and began to sing, “Let it Go.” The only words she knew were, “Let it go,” and that was fine. OK, it was amazing. Every moment with Florence this year has been special, but one of my favorites was definitely watching Frozen together. So many memories here in Uganda! I’ll never forget the faces and places from my year in the Pearl of Africa.